White Walls is pleased to present the new work of Parisian stencil artist, C215, in his third solo exhibition with the gallery titled Nina je t’aime. 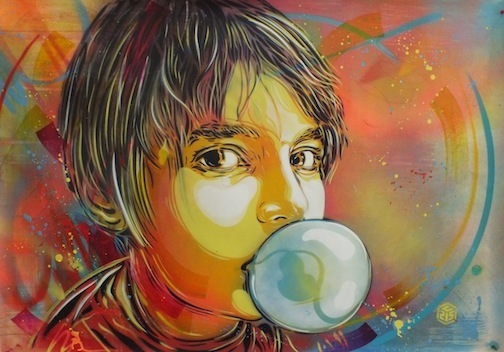 "C215's art captures a light, depth, and humanity that is difficult, and rare using stencils, his chosen medium. Stencils tend to flatten images and make them static, but C215 has developed a style of illustrating and stenciling that yields an impressionistic illumination of his subject's character." Logan Hicks ist ein Schablonenkünsteler aus New York, dessen Arbeit die Dynamik der urbanen Umgebung erforscht. Ursprünglich ein gelernter Siebdrucker, wurde die Arbeit Logans mit seinen von Hand gesprayten Stencilwerken rasch berühmt, aufgrund seiner Fähigkeit den manchmal mondänen Lebenszyklus des Stadtlebens auf eine tief bewegende und doch rafinierte Art und Weise einzufangen. Colab Gallery presents the sixth edition of PUBLIC PROVOCATIONS. It combines various styles, disciplines and techniques of Urban Art. PUBLIC PROVOCATIONS is opening on Saturday, June 14th at 8 pm and we are looking forward to seeing you there! Zur Ausstellungseröffnung am Samstag, den 14. Juni 2014 ab 20.00 Uhr, laden wir Sie herzlich ein. Born in 1973, the Mar- seille-based artist Stéphane Moscato draw his inspiration on punk-rock culture, and proposes a subtle and ba- lanced work between a very graphic and contemporary visual result and a social and polical use of mythology and symbols from history of art. Wheras collage and stencil techniques are considered as old-fashion by art critics, Stéphane Moscato takes the op- posite view in approaching in an original way the notion of original artwork and reproductibility. He realizes unique and polysemous artworks (never reproduced) which enable him to follow the meaning that can be drawn from theses pieces of street. 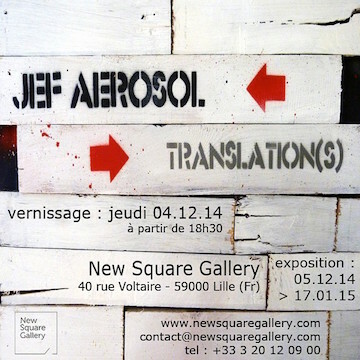 The exhibition Terrain de jeu, the first show at Openspa- ce gallery will present a selection of brand new pieces on canvas, book covers, paper and posters. Through the subject of introspection and self-knowledge, the artist reviews the emotions we feel as part of social interactions. From June 13th-15th, two concurring street art shows will take place exhibiting the works of 35 NYC based artists in Tehran, Iran, and 10 Iranian artists in Brooklyn, NYC. 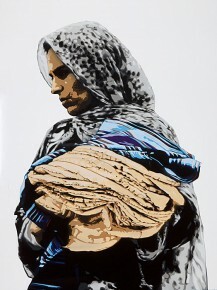 This cultural exchange initiated by Iranian exile artists, Icy and Sot is a first of its kind as there have only been a handful of street art shows in Iran, even less exhibiting foreign artists. The fact that there have been no diplomatic relations between the Islamic Republic of Iran and the USA for close to 35 years now have restricted all the artists to obtain visas and attend the shows they are exhibiting in. Adding to its complexity, all music, film, literature, and art in Iran are subjected to very strict censorship. Additionally there are many other anti-Western cultural laws including the banning alcohol. However, with these restrictions, the youth of Iran, who make up more than half of the country’s population, have began to fight back and seen a rise of artist underground scenes within the various mediums. Nevertheless, to this day there is little to no street art in Iran outside the propaganda murals commissioned by the Islamic regime itself. Icy and Sot who left Iran two years ago have now taken shelter in the dynamic and exploding NYC street art scene. To help bridge the gap of their old and new homes, they are curating the NYC TO TEHRAN & TEHRAN TO NYC shows with their friends. Opening parties for both cities will take place simultaneously on June 13th, with the time difference in mind. Come and join me for a drink at Metro gallery on Thursday the 12th of June to open my latest exhibition, the work is based on images from my trip to the middle east last year. The show is going to be opened by my good mate Fr Bob Maguire. Feel free to extend this invitation to any one who might be interested in coming along. At the turn of the millennium Melbourne’s visual street culture was undergoing the beginnings of an extreme makeover. 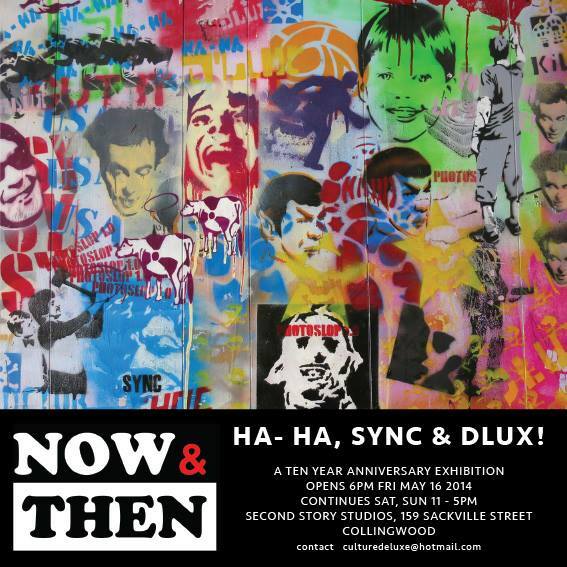 HA-HA, SYNC & DLUX! 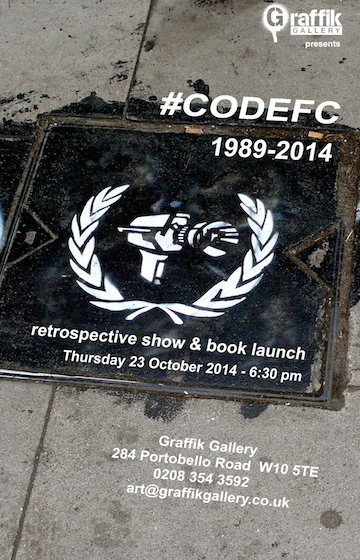 - pioneers of the city’s widely celebrated street art scene presented their first collaborative exhibition in 2003. It was an early experiment into bringing imagery most commonly found on the street into a gallery space. Many things have developed in the decade since then, in the artists, the communities, the spaces and the contexts in which they all operate. Now & Then is an exhibition that will present early works from these artists alongside more recent investigations in a celebration of times past and time’s passing. For this Gallery exhibit I created an array of patterns and portraits by incorporating modern and traditional use of paper cutting (Pochoir), hand applied textures, various paints such as aerosol, latex and acrylics to make my colorful, thought provoking artwork. My images will range from Queen Elisabeth to Ancient Buddhist Mandalas along with Graffiti and Endangered Animals. Come see me (and my biggest solo show for 2014) at the Opening Reception April 10th from 5-10pm during the Kirkland art walk.